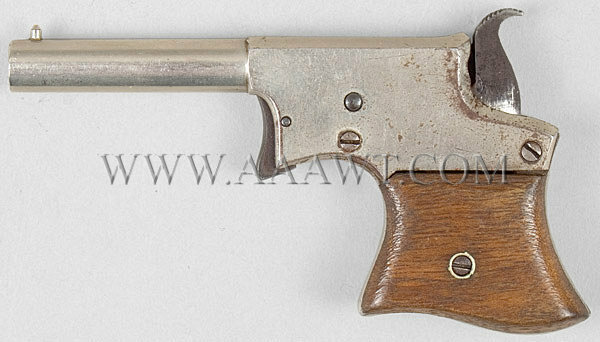 This .36 caliber pistol having serial number 35049 with 6.5-inch barrel remains in excellent original condition and has all matching numbers. 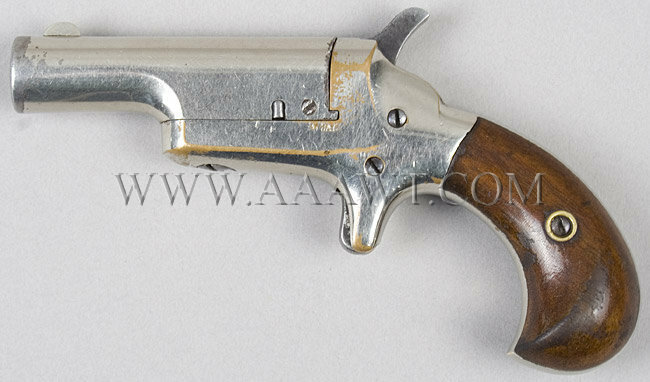 This metal remains in fine condition including much of it's original color having 90% overall blue, 50% case colors, 40% on the cylinder and 50% silver on the trigger guard and back strap. The cylinder has a few pits that have been retouched. Mechanically fine. The gun measures 11.5-inches in overall length. 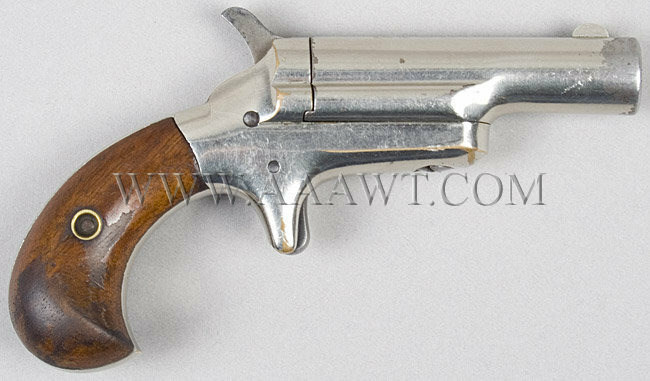 This .22 caliber pistol retains 95% nickel, 90% thinning blue on hammer and trigger. The grips are complete and unbroken with slight shrinkage top to bottom. Approximately 5.25-inches with 2.5-inch barrel. 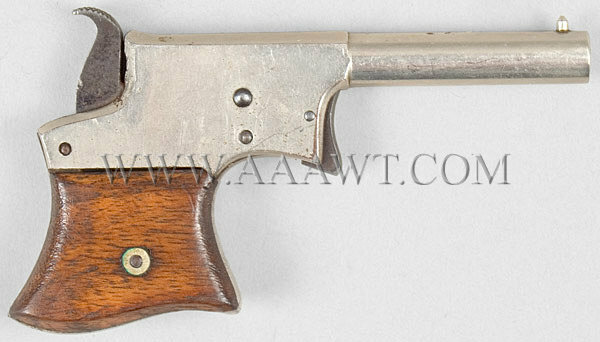 Plated frame and barrel, walnut grips, marked "-COLT-" in italics on top of barrel and SKU"41 CAL" on left side of frame, in production circa 1870-1912, retains 90%+ plating. 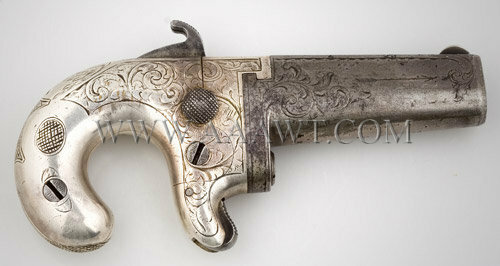 Terrific architecture with successful drop; long engraved tang signed "Smith's Improved Patent Stud Lock". The octagonal barrel in plum brown is engraved and retains front and rear sights and is marked "N. Kendall, Windsor, VT Patent". Stock with original finish. Engraver's signature is about half-visible, 30% silver on grip straps, 20% thin blue in protected areas of barrel, 85% varnish, excellent markings and mechanics. .41 Caliber, Serial Number 4105. A first model with Moore's Brooklyn mark on barrel flat featuring a beautifully engraved eagle and American shield on the back strap along with other deluxe engraving. 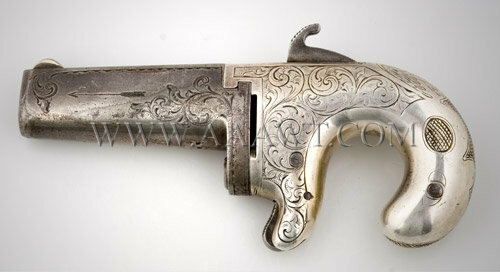 The frame retains about 100% silver; barrel is a smooth smoky gray; tight action. The few extant examples are in serial number range 3750 to 4339. It is thought that they were made circa 1864-1865 and were presented at the close of the Civil War to United States Military Officers.